The once Finnish company, Turing, has introduced yet another outlandish smartphone called the HubblePhone. Yes, Hubble like the Hubble Space Telescope to which it was named after. Now, I want you to sit still, and take a deep breath, because things are going to be a little bit far-fetched (though possible), and might even leave you breathless. Well, that’s how exaggerated this thing is but the company is more serious than ever. Turing’s HubblePhone will be (if ever materialized) the first multi-screen 5G smartphone with dual-CPU. 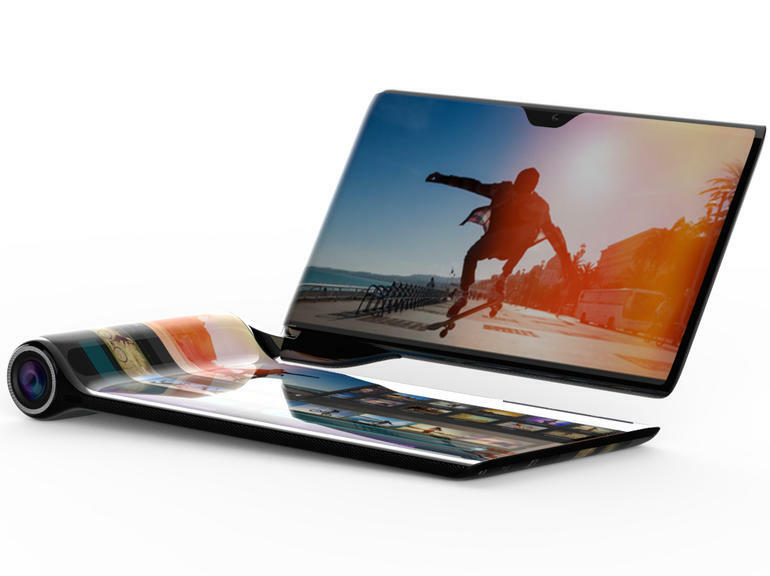 The design includes a dual display “decks”, one of which wraparounds in the entire device, the other would swivel out to revolve around a 60-megapixel main camera placed into a cylindrical section. Pretty much like the Nokia N90, except that all you get from all sides is a display. If 60-megapixel isn’t too overkill enough, the HubblePhone has couple more other cameras placed in almost all the sides possible to keep prospective buyers satisfied. So to sum things up, we have so far a dual wraparound displays, one ultra high-resolution main 60-megapixel camera (with 15x optical zoom), four couple other cameras on all sides possible, and a video editing software. Battery life must be bad in HubblePhone, you said. No. That is if we believe Turing’s claims. So here’s the fun part. The hardware is claimed to feature not one but two (yet unannounced) Snapdragon 855 SoC and one Snapdragon X50 5G NR modem, complete with dual batteries, a 2,800mAh and 3,300mAh, and three different operating systems. Three different operating system in one phone! I don’t know about you, but I am so confused about my feelings right now. The “upper deck” will run both Android P and a FreeBSD-based OS Turing calls Keplerian OS (named after Kepler of course), while the “main deck” uses Keplerian, Android P, and the Finnish-developed Sailfish OS for console mode. Yes, there will be a mobile game console mode. The HubblePhone, like many other smartphones, will also feature AI. With it onboard, Turing promises an “emotional machine-intelligence chip” that will provide a “next-gen mobile experience” by integrating AR, VR, MR and all the possible “Rs” in the world. It will even feature a lip reading technology, so texting your second girlfriend while first is around is easier than ever. How about that bad boy? “The most natural way to control a device is with our voice. In noisy environment HubblePhone utilizes lip reading technology, revolutionizing how we interact with mobile devices,” said Syl Chao, CEO of Turing Space Industries. Turing said that they have partnered with a number of “leading smartphone manufacturers to develop, produce and deliver” the HubblePhone. But it won’t be until Q1 2020 that we will see it come into fruition. With all the technology utilized, the HubblePhone will debut at a staggering price of $2,749. The smartphone will be available in the US by June 2020, Europe to follow by August of the same year, China by September, and the rest of the world by December 2020. Turing Space Industries (formerly Turing Robotic Industries), was originally a Californian company founded by former Nokia employees in 2015. It was then relocated in Nokia’s own home country, Finland, where they build their phones. According to the company, Finland’s strong privacy laws, and its historical connection with Nokia was its great motivation for moving in. Last February, The Verge reported that the Turing had stopped manufacturing smartphones after delivery delays and that their property in Finland was then seized, owing creditors nearly two million euros. Now back into the business, the new Turing is now headquartered in HongKong, with its R&D divisions located across North America, Europe, and the APAC.